The world’s sole pure limestone-based coniferous (Calocedrus rupestris) forest has been found in Phong Nha-Ke Bang National Park, the north central province of Quang Binh. 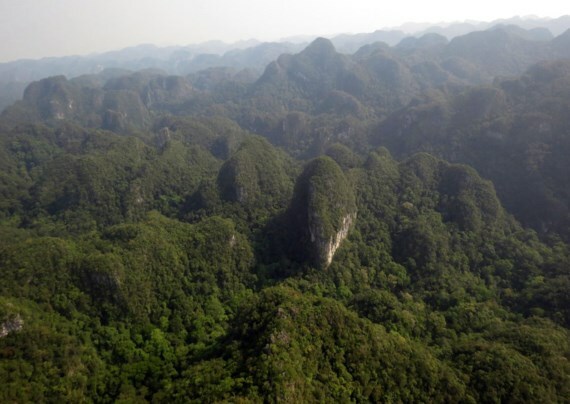 The over 500 year old limestone coniferous forest was discovered by Professor Leonid Averyanov from Russian Khamarop Plant Institute, Professor Phan Ke Loc from the Vietnam Institute of Ecological and Biological Resources and Phong Nha-Ke Bang Scientific Research and Wildlife Rescue Center in 2004. According to a study by scientists, limestone conifers grow scattered in some areas of the Central Highlands region of Vietnam. However they are not pure. Phong Nha-Ke Bang is the world’s sole home to the pure limestone coniferous species with the total area of 5,000 hectares and the density of 600 trees per hectare. Of the areas, 2,000 hectares are dense with the ancient conifers with the density of 600 trees per hectare. A number which scientists said unable to find elsewhere in the world. Mr. Le Thanh Tinh, director of the management board of Phong Nha-Ke Bang National Park, said that flora scientists estimated that the limestone based coniferous forest is the valuable asset of not only Vietnam but also humankind. The endangered species has survived and developed in highly eroded rocky limestone mountains for the last 500 years without any nutrition from soil, said Professor Leonid Averyanov. The species has iron-stiff trunk and limbs with sarsaparilla aroma attracting animals. Scientists discovered that the tree’s roots look like drill bits, soft like silk thread, filling crevices and adhesive together to take and keep water to nourish the three trunks. To exist and develop, the trees secrete a solution like acid to make limestone abrasive into tiny grains of sand creating a type of nutritious humus to feed the trees with the assistance from photosynthesis and rainwater melting limestone under their roots. The trees also get nutrition from millions of lichens, moss and algae on the face of limestone mountains after each winter. Mr. Nguyen Tan Hiep, former director of Phong Nha-Ke Bang National Park, said that he together with Professor Leonid and cadres from the Scientific Research and Wildlife Rescue Center had visited the pure limestone-based coniferous forest for two months. He affirmed that the discovery of the forest has a global meaning because there are only tree coniferous species that have been identified in the world. Vietnam has some conifers living scattered in some northern mountains. The wide population of limestone-based coniferous forest is endemic, only in Phong Nha-Ke Bang. The species’ wood is extremely rare and valuable, he added.